"A boy named Leonardo begins to imagine and then draw a world (in Africa)—first a rhinoceros, and then he meets some monkeys, and he always has a friendly elephant at his side. Soon he finds himself in the jungle and carried away by the sheer power of his imagination, seeing the world through his own eyes and making friends along the way." Raúl Colón is an award-winning artist. His creativity and imagination are quite impressive. This book about animals of Africa presents a non-verbal set of illustrations in a game preserve setting. An asthmatic child, confined to his bed, is depicted as the artist. The illustrations are rendered in watercolors and various types of colored pencils. Although it is a fun book and many preschool children will enjoy the drawings, it does not represent Africa in general or even a specific country. 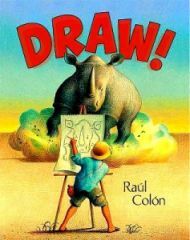 The book provides an opportunity for a student to practice oral and written skills by describing the artist’s imagined interaction with animals or it might be worth using in an art class to stimulate students in learning drawing skills and proportions of generic animal images, but it provides nothing of substance about Africa. Indeed it reinforces the stereotype of Africa as the wild kingdom.